Dwight and Gwynne Shaver began working among the Lambayeque Quechua people in the Andes highlands of Peru in 1991. This group of 20,000 speakers is very traditional, and it took many years of careful planting of God’s Word before the Shavers were trusted and accepted into the community. Back in 1980 we did not use computers to prepare the manuscripts. They had to be typed letter perfect, each page. So to do a reprint we were wondering how we could assure a quality product without having to re-key the text. With modern technology the print shop photographed each of the original pages and made the reprint exactly from the original. The result was a beautiful and accurate job done in a few months. The crates arrived from the printer in Korea. Inside were both these two New Testaments: son’s translation and father’s translation, new printing and reprint, highland and jungle, large group and small group. We praise the Lord for the team that makes this work possible—from the translators, to the publishers and printers, from the churches and individuals that contribute through prayer and finances, to the team on the field. Each of us provides a vital link in the chain that carries the load and sees this great work done for God’s Kingdom. Thanks for your part. Soon after we get back to Peru in September we expect to begin the layout of the Urarina New Testament. There are about 3,000 people in this Amazonian tribal group. Our work among the Urarina began in 1960. After 45 years they will finally have the New Testament in their language. As soon as we finish the Urarina layout we will go immediately to the Wanka Quechua New Testament layout. The Wankas are a large Quechua group of up to 500,000 people living high in the Andes Mountains. They have a history of being fierce warriors, never dominated by the Incas. Our work began with the Wankas in 1982 and we hope to see their New Testament dedicated next year. 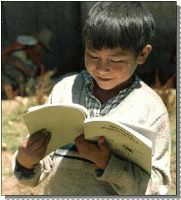 Later in the New Year we will see the Huaylas Quechua New Testament ready for layout. The Huaylas live in a high valley in the Andes. There are about 300,000 speakers looking forward to their New Testament. I shut down the computer for the last time and pushed away from my desk. I switched off the light, tucked my empty lunch bag under my arm and as I stepped out of my office I prayed for the publications team that would lose their leader for three months. Now, to pack—and unpack—and repack. Pack and move describes our life these past few months. In the vortex of transition it is hard to make the mental shifts from Peru to the US and back again, like being transported from one world to the next. Everyone asks, “Are you getting excited?” There is lots of extra work, long nights and many preparations to making international transitions. We were so grateful to God that we noticed in time that Sally and Jonathan’s passports had expired. I can’t imagine the trauma it would have caused discovering that at the airport as we tried to leave! Walking into our house in the US and being with our children was so wonderful. There is nothing as pleasant as reuniting with your children. And now we can add a couple more dear and precious people to our family. Loris’ husband, Thomas, is a joy to us as we are getting to know him. And Ondrej has a wonderful relationship with Jessica, whom we have already grown to love. It is easy to give our blessing to our children in the choices they are making in their lives. Laura and Jonathan have enjoyed a school break. Laura has graduated from her senior year and has been accepted at Harding University in an interior design program. She returns with us to Peru until next year when her studies begin. Sally and I have been wandering around the country, visiting churches and friends from Dallas to Winnipeg. We enjoyed the chance to see many we have not seen in years. Now we return to Peru. Please pray that we will have the energy and joy to be a blessing as well as see God’s blessing on us.